The inhabitants of Guernsey are well aware that the risk of suffering the occasional shortage is part and parcel of island life. But the 65,00-strong population is suffering its most unusual dearth yet. While animal sanctuaries across Britain continue to deal with a steady stream of abandoned and unwanted cats, in Guernsey it is a very different story. 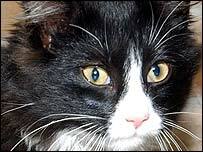 Cat owners have been so vigilant about spaying their pets the island is now suffering a kitten shortage. Since 2000 the number of felines being taken in by the Guernsey Society for the Protection of Animals (GSPCA) each year has fallen from 1,000 to 100. And that is leaving many of the the island's cat lovers disappointed in the search for a new pet. Jenny Fox, GSPCA welfare officer, said: "We are getting up to six calls a day from people who want a young cat or kitten and we have to just tell them to keep calling back in the hope some kittens come in in the meantime." The situation means the GSPCA has revised its previous advice on spaying. "What we now say is that if responsible owners want to let their cat have one litter before spaying, not litter after litter, then they should go ahead as long as they do it properly." Ms Fox said the GSPCA has also had meetings with sanctuaries in the UK to offer its services to take cats if any shelters are overrun. "In the 10 years I have been here I have never known anything like this - we asked cat owners to be responsible and they've done it too well."